Ever wondered what to do with that dusty old bricked Mac hardware? 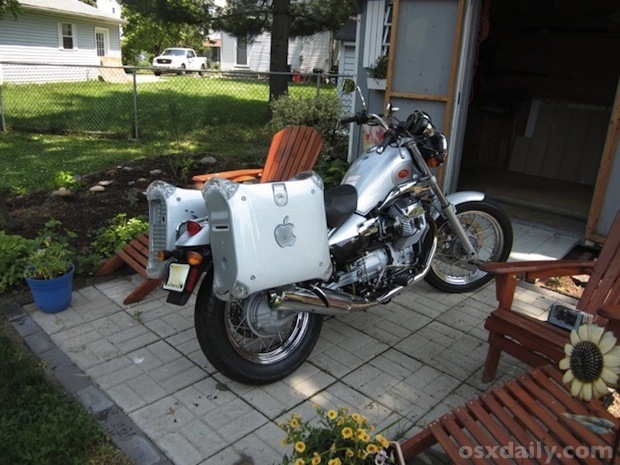 Rick H. is a Mac consultant from New Jersey who seems to have found the perfect answer for some old PowerMac G4’s; recycle them into saddlebags for his motorcycle! 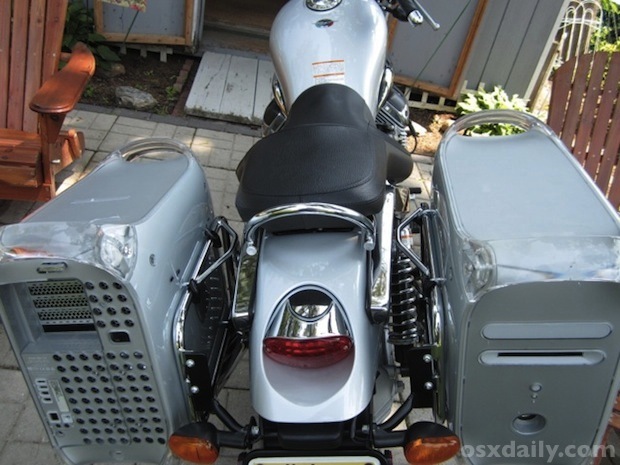 As you can see, two PowerMac G4’s are mounted aside the seat to function as saddlebags. 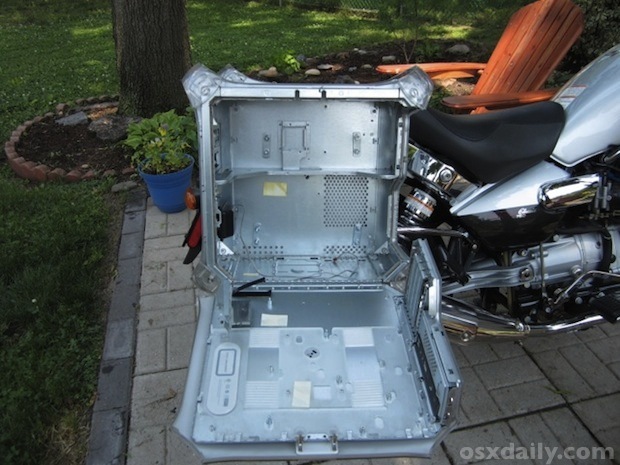 Each case is arranged so the natural door opens away from the Moto Guzzi, revealing perfectly functional storage compartments to store parts and even Rick’s MacBook Pro while he’s out on service calls. This is by far the most creative yet functional use of old PowerMac tower cases we’ve seen. This is just awesome and definitely rivals the Mac Cube fish tank for pure creativity. Thanks for sending this in Rick! Can my Mac play HD video content? I have to admit I laughed at this. I want one. 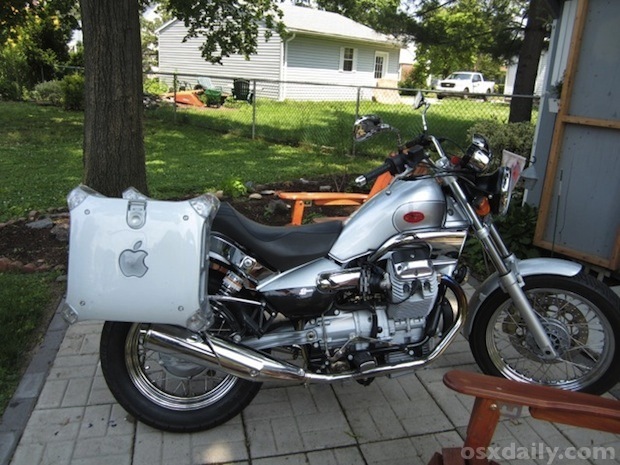 Rick should sell me his Mac bike. This is fantastically geeky, perfect for a consultant. Me too! I have a power Mac and the power supply went up in it. I really don’t know wether to let it die or sell it or what. Wow, this is very nice! It needs a heatshield. The plastic will warp and become discolored after a few rides. They are directly above the hot exhausts! 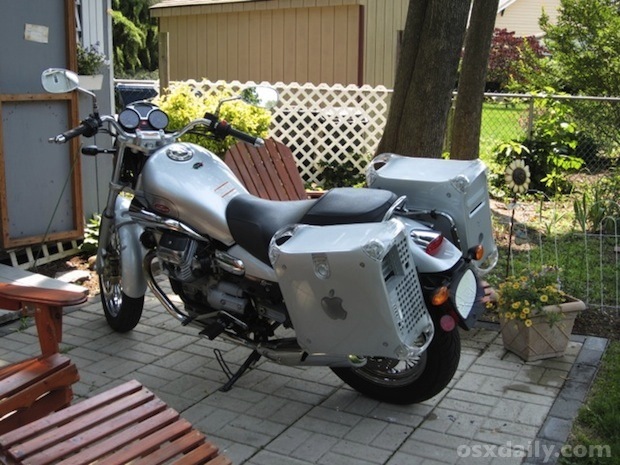 Definitely the right make of motorcycle! I wonder if Rick is a member of MGNOC.